When I was growing up, my mom always gave me an advent calendar at the start of December. Some years, it contained candy treats. Other years, there were little toys each day. No matter what small prizes the calendar contained, it was fun to count down the days to the most anticipated holiday for a kid – Christmas! I’ve continued the Advent calendar tradition for Dan and I by filling a calendar with small, non time-intensive activities to complete each day to get us into the Christmas spirit. (Here’s how I made an advent calendar, and here are some of the activities we have done in the past). I plan on having one for us this year as well, and I’ll share that one with you later in the week. This year, I decided to share this tradition with my two lovely nieces by making this Winter Wonderland Advent Calendar. I started by trying to figure out what kind of advent calendar I wanted to make. Would each day have a piece of candy, a toy, an activity to do to get into the Christmas spirit? I threw out the activity idea pretty quickly because we live so far away and there was no way we’d be able to be with them even some of the nights to complete them. 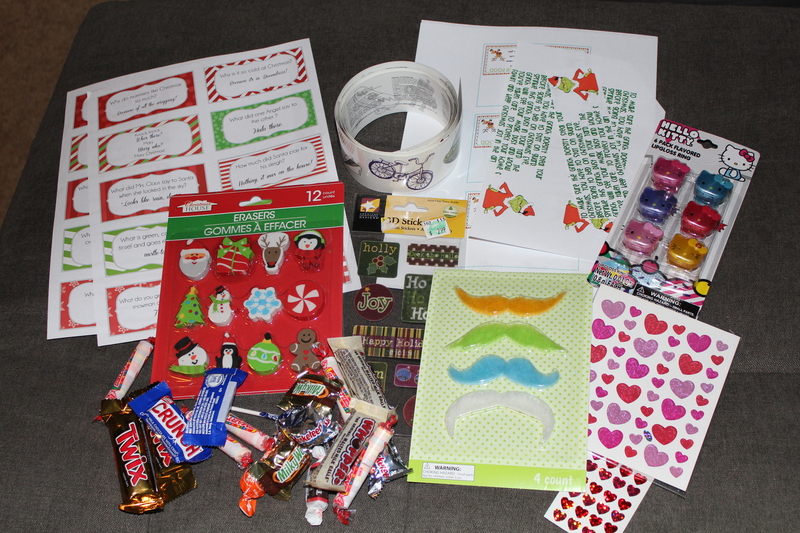 Ultimately, a mix of candy, stickers, lunchbox note jokes, lip gloss, temporary tattoos, and a few other little odds and ends made it in there. Then came the task of determining what I wanted the calendar to look like. Type “advent calendar” into pinterest and a million different kinds will pop up! They ranged from the not-so-crafty of using toilet paper rolls to super duper difficult creations that required the use of jigsaws. I settled for somewhere in between, once I saw these absolutely charming printable houses. 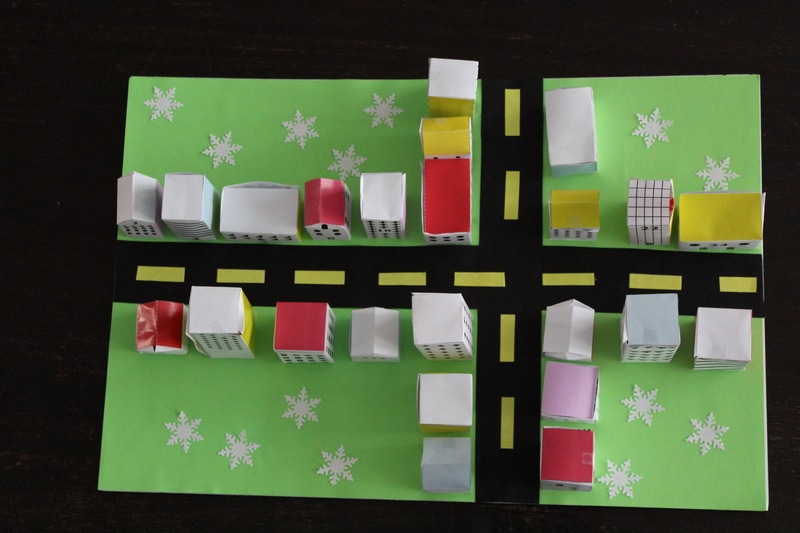 The idea is that you create a Christmas street with each house being a day of the countdown calendar. I was pleased that the color scheme was bright neons, a departure from the much more common red and green standard of Christmas. 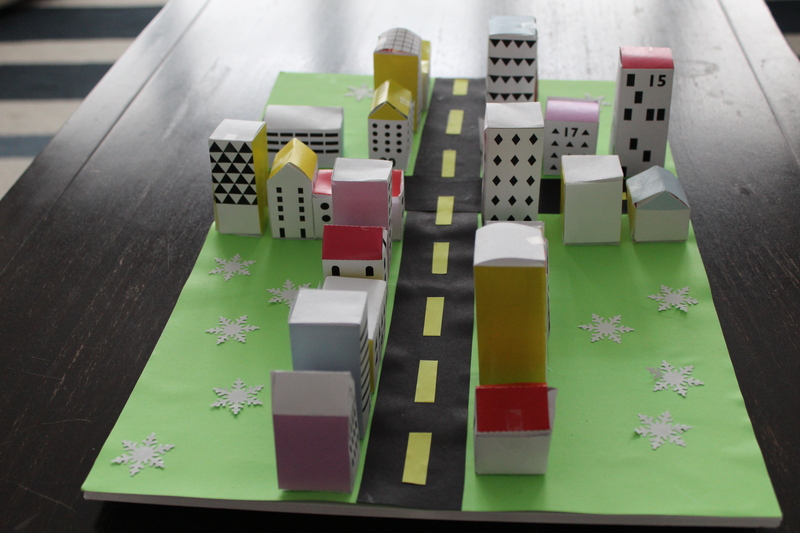 Plus, with the houses being made of paper, it was more kid-friendly than any wooden options. Putting the village together was pretty easy. 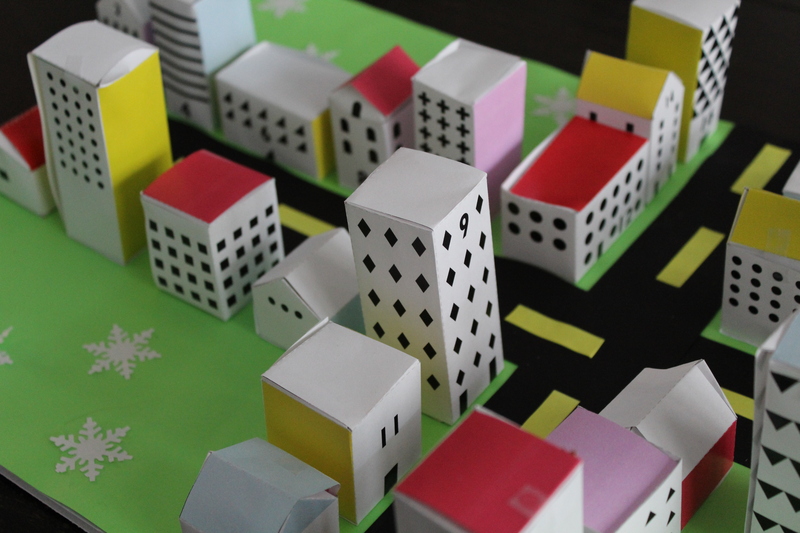 I just downloaded the printable, cut each house out, folded them as directed to make them 3-D, and secured with tape. I bought a piece of foam board, glued down some green neon paper for the grass, and created the roads with black cardstock and neon yellow paper for the lane lines. When I glued down the houses, I didn’t fully close them so I could put all the little trinkets inside them at once, making a point to space out some of the items I had more than one of to give. I gathered up the small treats, and added something to each house – making sure I put 2 things in there (one for each girl). There are three fillers that really were something special. For one of them, I included a note for the girls to have their mom and dad call Uncle Dan and I, so we could read them a Christmas story that night. In another little house, I put handmade finger puppets of Olaf and Elsa. (I hear Frozen is in with the pre-school/kindergarten crowd these days). I forgot to get a photo of them, but here’s where I got the idea. Finally, for Christmas Eve, I wanted something special. I’d made the girls reindeer food before, so I didn’t want to do that again. Instead, I made Grinch dust, to keep the Grinch away. 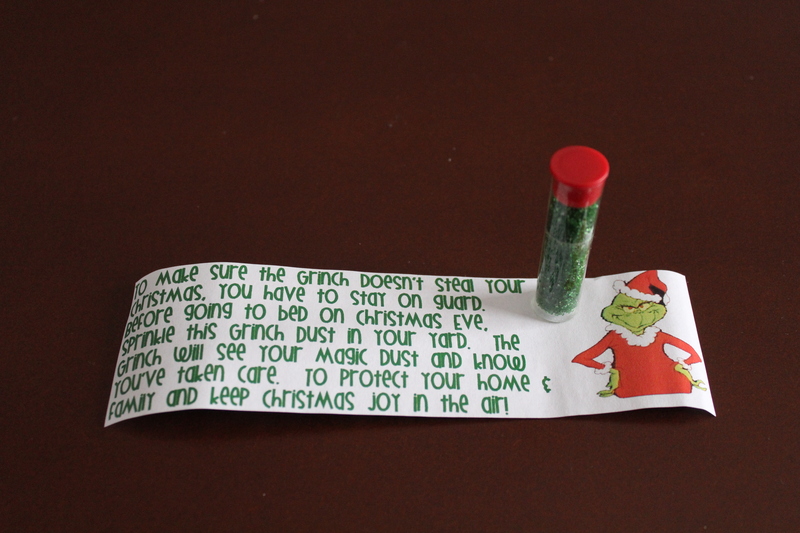 I found the printable explaining what Grinch Dust was here, filled a small tube with green sugar sprinkles, and voila – Grinch dust! I hope the girls have as much fun opening each little house as I did in making this.